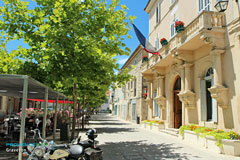 The Departement of Bouches du Rhone - Alpilles - Pop. : 5,000 inh. Between Saint Rémy de Provence (10 km to the south, on the D5) and Avignon (13 km to the north, on the N570). Betwen Tarascon (10 km to the west, on the N570) and Châteaurenard (8 km to the east, on the D28). 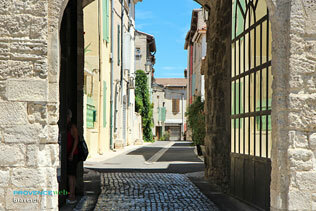 Situated between the Rhône and the Durance, Graveson is surrounded by all the poetry of the Alpilles with wooded hills covered in pines, olive trees and cypresses. 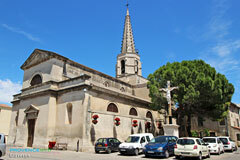 Be sure to go and visit the Abbey of St Michel de Frigolet which is just a few kilometres outside the village. Graveson is not especially rich in terms of heritage but it shares all the charm of these villages of Provence, with their houses huddled tightly together, their avenues of plane trees, shady little squares, fountains and terraces which come to life at aperitif time. Graveson has two museums which deserve a visit. The first is the Museum of Aromas and Perfume, housed in a lovely 19th-century farmhouse, where you can explore a whole world of delicate scents. Here are the precious stills used to produce an astonishing range of perfumes, together with copper vats, perfume bottles and diffusers (including an impressive collection of 19th and 20th-century examples), as well as essential oils and products associated with aromatherapy. 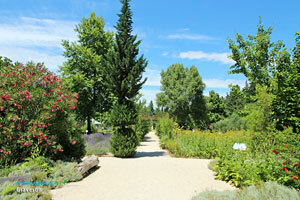 Your visit also takes you to the Carré des Simples where aromatic plants are cultivated according to the purer (i.e. organic) traditions of the Middle Ages. 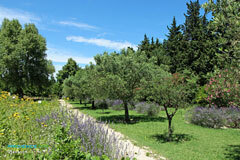 The plants grown here include verbena, mint, lavender, basil, rosemary, savory and many more. There is also a shop where you can buy a little something to make you smell and feel good. 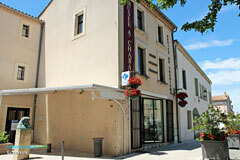 The Auguste Chabaud Museum provides an opportunity to find out more about the work of this painter who lived in Graveson. He painted, sculpted and drew from his base at this farmhouse near La Montagnette until his death in 1955. He received visits here from his friends, Matisse and Derain, together with whom he belonged to the Fauves Movement. Three-day trips are available for those who fancy total immersion in the world of Auguste Chabaud. Don’t miss the festival of St Eloi which takes place at the end of July, with the famous Cart Race (twenty cart horses pull a cart decorated with flowers and foliage through the village at a gallop), as well as bull races, abrivado, bull shows in the arena and, of course, the ever-present pétanque competitions! Museum of Aromas and Perfume. La Roubine. 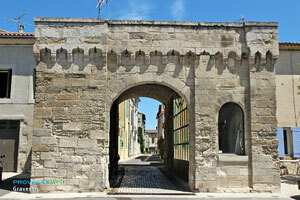 Le Grand Portail. Breil Château. Four seasons gardens (viburnum collections, children’s activities). 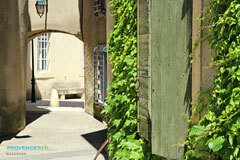 Market every Friday morning (Cours National) and farmers’ market, Fridays 4pm to 8 pm from May to October. 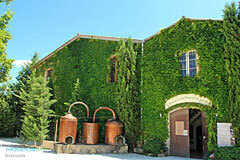 Crafts: Visit the santons de Roze studio. Artists studios - painting, fabrics and painting on silk. Arts and crafts: scale models and professional models. Tennis. Squash. Cinema. Summer events. Member of "Châteaux et Hôtels de France"
Maillane (3km), Eyragues (5km), Rognonas (8km), Barbentane (10km).